This is not a recipe I grew up eating. 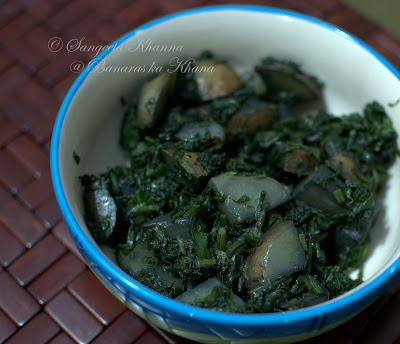 Although Alu-palak was a regular, my mom used to cook it differently. She would put aubergines (baingan) to this many times, or would puree the spinach to make a gravy curry with paneer, potatoes and sometimes green peas as well. Other times she would chop the potatoes in thin fingers and make a quick alu-palak in an aluminium kadhai or brass kadhai. The potatoes in that case would remain lighter coloured and would retain their own entity. 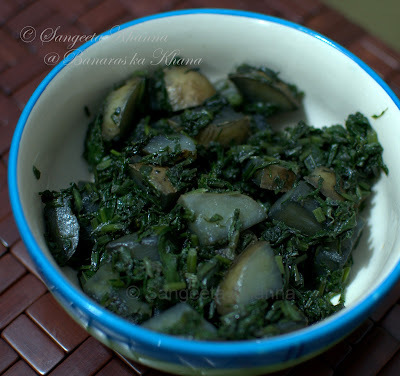 We all loved that one too but when the husband once told me about the alu palak his mom used to cook, being black in color and how he loved that version, I tried to recreate that. It was a simple thing, just slow cooking in an Iron pan. I just asked him a few things about how the potatoes were cut and if there was any fenugreek or cumin in it. This time his memory was accurate and he told me it was just the alu and palak. I figured the rest as I know my MIL does the simplest of recipes and there is no garlic onion used most of the times. It is the procedure and the cut of the potatoes that made this recipe taste different form my home. After a few trials I came to this 3 ingredients (well, 5 if you include salt and oil too) recipe that was recognised as the original, and thanks to my love for spinach, I loved this version the most. Almost. this recipe uses an Iron pan so make sure you have it, otherwise it just wont taste the same. Cube the potatoes in thick pieces. You can cut them into thick wedges too. Just take care they are thick enough for prolonged cooking. Thinner slices would get mashed. Chop the spinach into strips (chiffonade). No need to cut them very finely. Heat the oil in the Iron kadhai and quickly mince the green chilies while the oil gets heated. You can also just slit the chilies if you wish. Add them to the hot oil and then quickly add the potatoes as well. Add salt and mix well, keep stirring for about 2-3 minutes. Salt should be a little less than you would normally add because spinach is slightly salty sometimes and slow cooking in an Iron pan makes it taste alkaline sometimes. Add the spinach just after 2-3 minutes of the potatoes being seared. Mix well and cover to cook. On very low flame. Keep stirring after every 5 minutes or so, it leaves a lot of water first and then starts absorbing it. Needs to be cooked for about 30-40 minutes, stirring once in a while, till all the water gets absorbed. The potatoes will turn green first and then a very dark green, almost black colour. Bhuno the subzi till it starts sticking to the pan a little, take care not to break the potatoes. Serve hot or cold. You would always see this subzi disappearing quickly from the table. The picture here is from the leftovers I had some time ago when I cooked it for dinner. It makes a nice lunch box subzi as well. You would love it if you are a spinach lover. The potatoes absorb the taste of the spinach and get really changed. For spinach haters I am not very sure. Aloo palak looks delicious. Sure I am going to try your recipes. OOo, that sounds good! Even if the potatoes turn black, the combination sounds delicious.